Upper Thomson is a foodie’s best friend – it’s home to many popular cafes such as Pacamara, Habitat Coffee and Atlas Coffeehouse, and at the same time, has a few of the best Kopitiam you can find in Singapore. You can tell when they are fully packed for lunch, dinner and even supper almost throughout the week. Personally, it’s one of my favourite supper places to get my late night cravings sorted out. And you know what? There’s a new place inside a Kopitiam that serves really HUGE and succulent Western-Asian fusion rice/soba bowls at a very reasonable price. 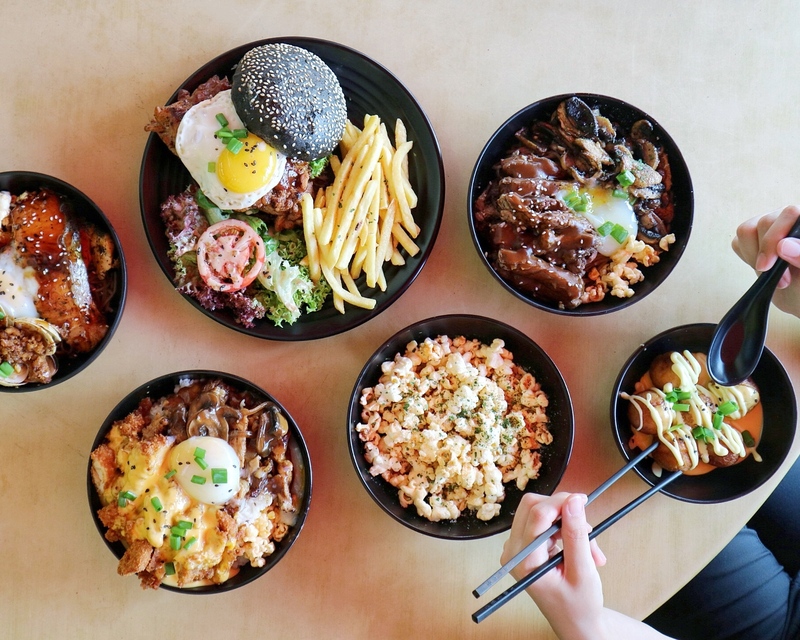 Located within 236 Upper Thomson Road, Indulge SG offers wallet-friendly yet restaurant-quality dishes such as Nachos Cheese Chicken Cutlet Rice Bowl, Ribeye Steak Soba Bowl, TRUFFLE Popcorn and many more! Trust me, you’ll definitely be surprised just like I was! Psst! You can skip the queue if you’re ordering in bulk (presumably for corporate events or parties) by pre-ordering at 9829 3168! They don’t look like something you would see in a kopitiam isn’t it? They are nicely-presented and honestly, the standard is way better than some of the restaurants/cafes around. Oh yes, they are very generous with the portion served. Even with 4 persons, we couldn’t finish all of them. My mouth is salivating once again after looking at this picture again! Huh?!!! Popcorn? Why are you serving me popcorn? I don’t want to eat them in a kopitiam?!! Initially, I was really sceptical about this dish but it was so addictive, we literally had to force ourselves to stop. I guess you can order them as a ala-carte but it does comes as a side when you order a rice/soba bowl. Popcorn was filled with truffle aroma/flavour and yah, can’t believe it’s so tasty. I’m willing to dapao this into a cinema and perhaps they should consider collaborating with GV to sell this Truffle popcorn! So darn good lah! The takoyaki was not too bad. Generous fillings and it was not too chewy. Loving the sweet-savoury sauce that makes the takoyaki even tastier. Ssshh.. it’s better than some of the places in the mall that sells takoyaki! Before we even start, look at that perfectly cooked poached egg! The steak was well-cooked, tender and juicy. And that sauce on that steak is ? Mushrooms were also well-seasoned with truffle. How to eat this? Mix them all up because the combination was really good! People who loves seafood, please remember to get this! Salmon was not over-cooked, has a really nice melty texture and that sauce again is finger-licking good! Some of you might find the sauce a tad sweet but I liked it that way. Clams were also soaked with Hae Bi flavour (not my cup of tea because I never liked Hae Bi). Very flavoursome soba bowl indeed! Okay, this was my favourite dish at Indulge! I mean who can ever resist Nachos Cheese and Fried Chicken Cutlet? I can’t for sure. Chicken cutlet was fried to perfection; crispy and not too oily. And they are super generous with the nachos cheese drizzled atop the chicken. Highly recommended and I’m definitely coming back for this again! Burgers fanatic, you definitely need to try this HUGE Chicken Chop Burger! Chicken Chop was well-marinated, tender and flavourful. Charcoal buns were also lightly buttered and soft. And I loved that old school French Fries which is well-seasoned. Previous Post8 Places in Singapore to GET your Bubble Tea Cravings Sorted Out! Next PostSpinelli Coffee: Opens Brand New Outlet at Tampines Hub with Breakfast Menu as LOW as $2.80!!! !